This past week I attended a training session at the Board of Realtors for a newly updated product used by the MLS called Realist. While I’ve used the product in the past, I must say I was blown away by the new reports and functionality. The usefulness to Realtors just multiplied exponentially. 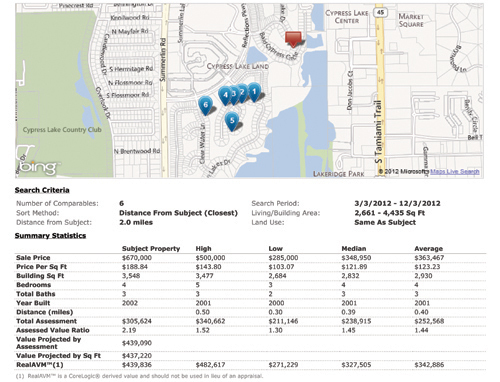 New Tool Assists Realtors Value Property! There is a lot to the program and it will take agents some time to learn how to use it effectively, but it will be an investment well worth it. I’ll attempt to show snippets of a few of the reports, but it won’t do it justice. Once Realtors get the hang of the program it will save time and produce some amazing research results. The program not only identifies and provides a multitude of information about a subject property, it also helps identify comparable properties, market trends, and useful neighborhood information. The trick to providing accurate valuations has been and always will be interpreting the data. One of the things I was impressed with was the AVM (Automated Valuation Model). The AVM identifies provides a range of value along with an estimated value. It comes with a degree of confidence and a Standard deviation, the higher the confidence and the lower the deviation the greater its accuracy. Let’s say it determines a property has a AVM value of $200,000 with a degree of confidence of 87% and a standard deviation of 8%. What it’s really saying is they feel the property has a 87% chance of selling 8% +/- of $200,000. The system does a nice job of identifying comparable properties through both MLS and tax data and mapping them as well as a grid format complete with details. It makes it easy to select the best comparables. Another feature I liked was the market conditions in the neighborhood, zip code, and the city. 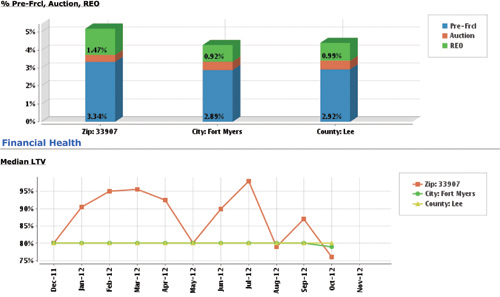 It showed graphs of median list prices over time as well as median sale prices over time. At a glance an agent and seller could see market trends which would be helpful in pricing a home. There is even a distressed property section which shows foreclosure rates and identifies the percentages of homes in pre-foreclosure, sold at auction, and in REO (Real Estate Owned) status typically by the lender. I ran a sample report on a property after studying the comparables and it generated a very nice and informative 25 page report. I talked to some agents this week who didn’t go to the class. They felt since they worked more with buyers than sellers it wouldn’t benefit them as much, but I would argue it would. Buyers can benefit from these reports too. There is a neat report that shows all the neighbors, how long they’ve owned, what they paid, and quite a lot of information on each house. It provides this all in a map format along with a neighbor report. What a great way to show stability, or find out who the neighbor is with the barking dog. If you see they’ve lived there since 1988, chances are they might not be moving anytime soon. The system provides walking and driving distances to schools, businesses, restaurants, etc. It will even rate the schools with a 3rd party rating service. The software incorporates census data too and combines all this in an easy to digest format. I particularly like the section that shows MLS data and tax data and points out where they differ. The system makes no attempt to explain which is correct. It’s possible the owner added on to the house without a permit, or perhaps there is an error on the listing. Either way you’re miles ahead of potential problems at a glance. If you’re a Realtor in the Greater Fort Myers MLS, you’ve got to spend some time with this product. If you’re a customer, you’ll be amazed at the results. And the best part is, Realtors in the Florida Gulf Coast MLS have access to every county in Florida. It’s so exciting to live in the age of useful technology. One day soon we’ll wonder how we ever lived without programs like this. Good luck, and Happy House Hunting!!! !